Kyle Okposo works the puck in the Leafs’ zone against defenseman Jake Muzzin (8) as Zemgus Girgensons (28) sets a screen in front of the net Wednesday night (James P. McCoy/Buffalo News). Driving down Washington Street to The News building 90 minutes before faceoff, I saw 26 fans in Leafs jerseys between Sahlen Field and Harborcenter before I saw a Sabres jersey. And that one was a Marcus Foligno No. 82, not even someone on the current team. It set the stage for another one of those crazy frenetic nights with the Leafs in the building. Of course, it was another loss for the Sabres, a 4-2 defeat that shouldn't have been remotely that close were it not for exceptional play in the Buffalo net by Carter Hutton. • That's 41 games and counting without the Sabres winning two in a row. It's 0-11-1 in the games after wins, dating to Dec. 18. It's a mind-boggling number. "I wish I could put it into words. It's obviously frustrating," Hutton said. "A lot of us wear it on our sleeve here. We put so much into this. ... You want to win, want to contend and help this team get in the playoffs." Not happening this year. Again. • The Leafs' top players were dynamite. Auston Matthews and John Tavares had two points apiece, combined for 13 shots on goal and 20 attempts. Matthews was a beast and it seemed like he could have had five or six points were it not for Hutton. "I thought we had lots of good players tonight," said coach Mike Babcock. "We had guys jumping right from the get-go." • The Sabres' top players were not good. Jack Eichel and Sam Reinhart were minus-3, with Eichel's blast wide in the 6-on-5 situation leading to the Rasmus Dahlin turnover that created Zach Hyman's empty-net goal. Jeff Skinner and Conor Sheary combined for one shot on goal and were minus-2. So was Rasmus Ristolainen, who was on the ice for three Toronto goals and saw his rating sink to an NHL-worst minus-39. Ristolainen is an astonishing minus-23 in 17 games since Feb. 15. It's a funky stat, sure, but that's still some brutal play down the stretch of a season. 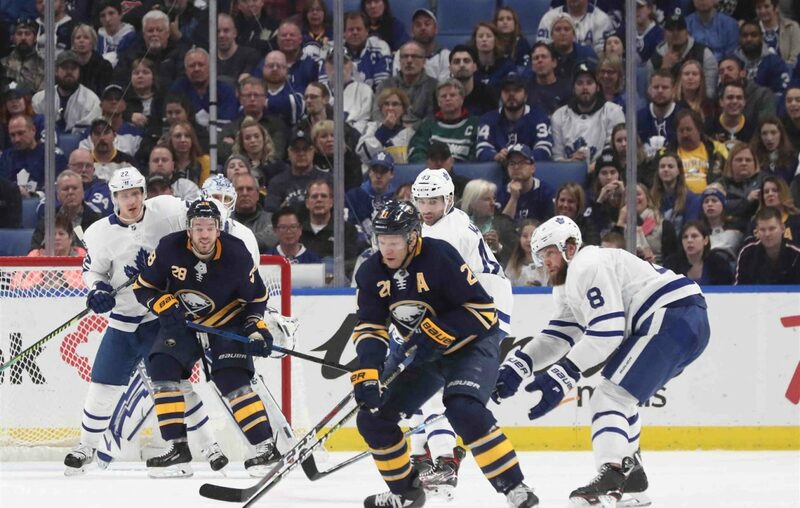 • Eichel took a foolish cross-checking penalty on William Nylander in the first period Drilled him from behind. Lucky there wasn't an injury or there could have been another suspension for the captain. That's the third time this year he's hit a guy from behind near the boards. Bad habit he better break quick. • The Sabres were owned in their own building by their archrivals and their fans. Again. Phil Housley was spitting nails after this one. This group of Blue and Gold doesn't seem to have enough hate of the Blue and White like Buffalo team's did in Housley's day. No excuse to be so flat right from the opening faceoff. People want to blame the coach for that. He's not on the ice. Blame the guys in uniform. Show some pride. • Leafs goalie Garret Sparks was good enough when he needed to be. Stopped a Johan Larsson breakaway when the shots in the first period were 17-2 for the Leafs. Made a couple key saves in the third when things were dicey at 3-2. "You just have to stay engaged, stay focused," said Sparks, who graduated from the AHL this year to back up Frederik Andersen. "I had a lot of experience with that last year with the Marlies. we were a possession team and there were stretches of times I didn't see the puck much." Sparks, a backup goalie who has hardly earned the right to speak much, said his team didn't have much emotion after Saturday's 6-2 loss in Ottawa. Coach Mike Babcock was frank here Wednesday morning when asked if Sparks' words put more pressure on him. "I would think so. I expect him to play well," Babcock said. "I just know in life you own everything yourself. When the team isn't playing well, it's my fault. If I take responsibility for that, I can fix that. If you're the goalie and your team doesn't win and you own it, you can fix that. Any time you're looking for any other help in life, it doesn't usually go your way." • In the morning, Housley said Hutton is keeping things simple and not worrying about things he can't control. The translation in this view is that Hutton was fretting about his brutal run of goal support and letting it impact his play in the net. As bad as Linus Ullmark has looked of late is how good Hutton has looked. "I just try to compete the best I can. A lot of things are out of my control," Hutton said. "I just try to simplify it and do what I can do. We have a young team. It's a little different. It's been an adjustment coming from a veteran team to a younger team so I just try to take it as it comes, compete and at the end of the day try to win hockey games." • Hate the scratching of Jason Pominville. He's a veteran who might be in his final year with the Sabres. This might have been the last Buffalo-Toronto game he was ever going to be a part of. And, for the record, he's fourth on the team with 15 goals. He darn well better play Saturday night in what could be his final game in Montreal. But we have to continue to be force-fed a steady diet of Vladimir Sobotka and Tage Thompson, clearly at the behest of GM Jason Botterill because he acquired them in the Ryan O'Reilly trade. There's no way Phil Housley or any other NHL coach would keep playing those two every night. It's not possible. • The Leafs came here on a late-night flight from Nashville, where they played Tuesday night on the first half of a back-to-back. The Sabres did that exact same back-to-back when they hosted the Leafs here in December, and Columbus will do that next week when it plays in Buffalo the night after a trip to the Music City. Memo to NHL schedule maker: You're aware Nashville isn't close to Buffalo -- and you lose an hour on the time change coming here, right? What's up with this? Stop it. • Final shots on goal were 46-24 and attempts were 77-47. So which team was playing on a back-to-back and which team wasn't?